Carbon monoxide is a colorless, tasteless, odorless gas that results from incomplete burning of solid, liquid, and gaseous fuels. This gas can cause dizziness, nausea, coma, or death if breathed in sufficient amounts. The neighbors could set a clock by Dr. Smith's morning routine. He turned off the porch light at 6:00 a.m., picked up the newspaper from the driveway at 6:15, and took the dog for a walk at 6:30. One winter morning, Dr. Smith's next-door neighbor noticed that none of these things had happened. He knew the Smiths were home, but they did not answer the doorbell or the telephone. The neighbor called the police, who broke into the house and found four unconscious people. The gas heater had shut off during the night and had been giving off carbon monoxide gas for many hours. The Smiths were rushed to the hospital and treated for carbon monoxide poisoning. Dr. Smith and his wife and children were lucky; they were found in time and recovered completely after several weeks. Carbon monoxide (CO) is a chemical created when some fuels, such as coal and gas, are burned. CO is toxic because it reduces the amount of oxygen received by the body's cells. Red blood cells contain a protein called hemoglobin that carries oxygen to the body's cells. Because CO binds much more easily and tightly to hemoglobin than does oxygen, CO will replace oxygen in the bloodstream when inhaled. When that happens, the cells that need lots of oxygen, such as those of the heart, skeletal muscles, and central nervous system, cannot function properly. Dr. Smith and his family suffered acute * CO poisoning, in which a large amount of CO was breathed at one time. This kind of poisoning can lead to death: it kills 25 to 40 percent of those exposed. Survivors may feel symptoms for days, months, or years. CO poisoning also can be chronic * . A small amount of CO inhaled continuously or frequently over a long period of time does not kill, but it does impair oxygen flow to the brain and may cause long-term nervous system problems, such as headaches, dizziness, weakness, sleepiness, nausea, and vomiting. Low-level chronic exposure to CO is especially serious for people with heart, lung, or circulatory problems, and for infants and older adults. Developing fetuses also can be affected by CO poisoning. 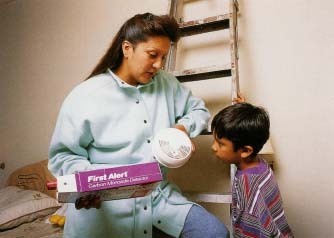 Carbon monoxide detectors for the home look like smoke detectors and can be installed to monitor for CO fumes. CO is one of the most prevalent poisons in the environment. It can get into buildings, homes, and vehicles in many ways. Sources of CO include car exhaust, gas or oil furnaces, kerosene lamps, space heaters, improperly installed appliances, wood stoves, wood-burning fireplaces, and tobacco smoke. CO poisoning most often occurs during winter months, when people use heaters and fireplaces. How Is CO Poisoning Treated? A person with acute CO poisoning requires extra oxygen as soon as possible. The individual may be given pure oxygen to breathe. A hyperbaric (hy-per-BARE-ik) oxygen chamber also may be used to treat CO poisoning. This is a large chamber that holds the patient, and sometimes the medical team. The chamber is filled with 100 percent oxygen, and the pressure is increased to three atmospheres (three times the pressure of the air near the earth's surface, or the pressure the body feels about 90 feet under water). Pressure and pure oxygen help the oxygen molecules displace the CO attached to hemoglobin. Diagnosis and treatment of chronic CO poisoning may be more difficult, because its symptoms are similar to flu and many other conditions. Can CO Poisoning Be Prevented? Never burning charcoal in a tent or camper to keep warm. Installing water heaters and gas appliances properly and checking them often to make sure they are operating correctly. Keeping chimneys and wood-burning fireplaces clean. Never letting a car idle inside a garage, especially if the garage is attached to the house. Installing commercial CO detectors (similar in design to smoke detectors) for the home. The U.S. National Center for Environmental Health at the Centers for Disease Control and Prevention (CDC) posts a Checklist for the Prevention of Carbon Monoxide (CO) Poisoning at its website. The U.S. National Institute of Neurological Disorders and Stroke posts a fact sheet at its website about anoxia and hypoxia from carbon monoxide inhalation and other causes.